The coatimundi is a member of the raccoon family that is diurnal, meaning it is out mainly during the day.  The coatimundi is an omnivore that eats both plants and meat. They have long noses that are used to poke under rocks and crevices looking for insects and small animals. Coatimundis in the wild typically live between 7 and 8 years. In captivity, coatimundis can live between 15 and 16 years of age. Coatimundis are typically between 13 and 27 inches from the tip of their nose to the base of their tail, which can be as long as their bodies. They weigh anywhere from 4.4 to 17.6 pounds. Males are typically larger than females. Coatimundis have either a light brown or black coat and have a long ringed tail. They have paws like raccoons. Coatimundis have a long snout that is some-what like a pig's snout and is very flexible, able to be moved 60 degrees in any direction. Unlike most members of the raccoon family, coatimundis are diurnal; they are more active during the day than at night. Female coatimundis often form loosely organized groups that can include up to 25 individuals. 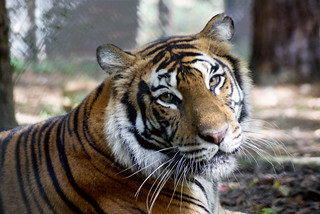 The males are typically solitary due to their aggressive tendencies. Coatimundis are widespread and live in habitats ranging from hot and arid areas to humid rainforests and even to the cold mountains of the Andes. The coatimundi’s principal threat is habitat loss. Though these animals are very adaptable, they are running out of available land to keep their numbers up. 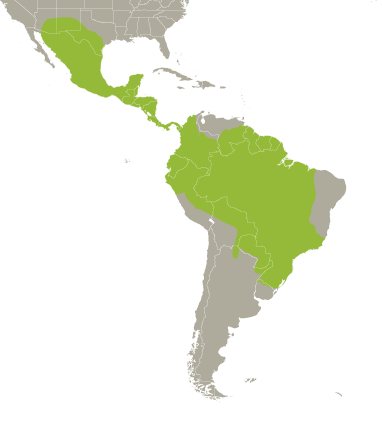 Coatimundis are found from southwestern United States down through Central America and into Brazil. Coatimundis are omnivores. They eat mostly ground insects and fruits. They spend a lot of time foraging for food, but will also eat small vertebrates, such as lizards and rodents. Coatimundis become sexually mature at about 2 years of age. Their gestation period is about 77 days. Typically, 3 to 5 coatimundi kits are in a litter. Coatimundis spend most of their day foraging for food, unlike their other relatives in the raccoon family that are typically nocturnal. When provoked or for defense, coatimundis can be very fierce, using their sharp teeth and claws to attack potential predators. Coatimundis will use various sounds to communicate their intentions within the group, like chirping or grunting sounds. 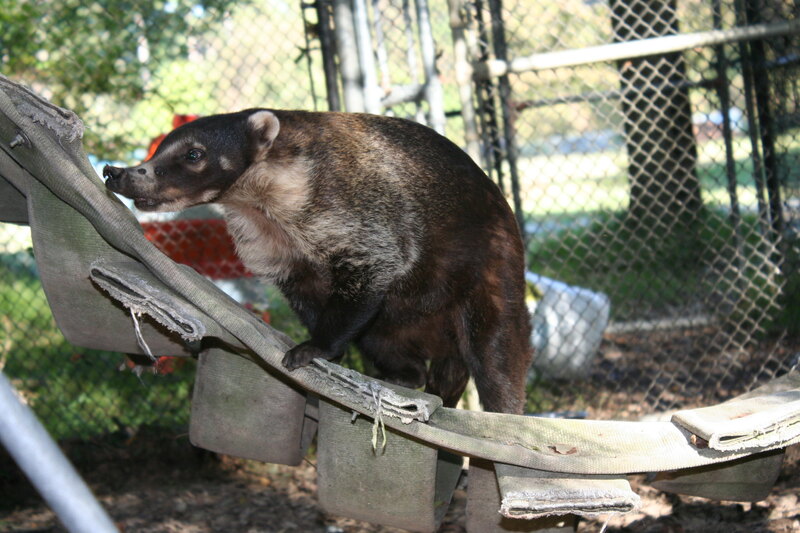 Coatimundis have scent glands on their necks and bellies that are used to mark territory and to recognize one another. Coatimundis are classified as "least concern" on the IUCN Red List.